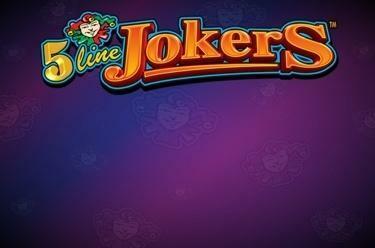 Play 5 Line Jokers™ online for free now! Cheeky fruits, the number 7, shining stars and the joker as the crowning glory - this is the mix that will let the tills ring at 5 Line Joker™! Melons, cherries and more as well as the lucky number 7 will let Twists rain on you: They'll guarantee a high mystery win. And if the wild joker makes an appearance your luck will be doubled: It can replace all the symbols and get you even more Twists! 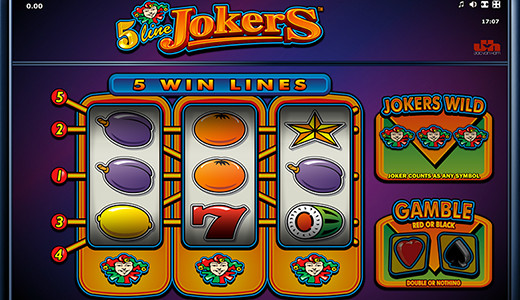 You play 5 Line Jokers™ on 3 reels and 5 win lines. Your aim is to land 5 matching symbols along a win line, which cannot be interrupted by another symbol. The win lines run from the left across the reel to the right. 3 Star symbols on a win line will get you a Mystery win, which could be up to 25x your bet. The joker can replace any symbol on the win line.